Alison Donnelly was presented with this 1795 map of Ireland by the directors of Celtic Studies at UWM for presenting a talk at the Certificate Ceremony on 9 May. She was appointed to the Celtic Studies Advisory Board in October. 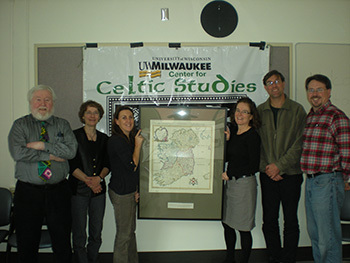 Members of the Board (from left to right in the photo) are as follows; Michael Gleeson (retired director, Celtic Studies, UWM), Jose Lanters (English, UWM), Alison Donnelly (Geography, UWM), Bairbre Ni Chiardha (Celtic Studies, UWM), Andrew Kincaid (English, UWM) and Tim McMahon (History, Marquette University).